Abes Market is by far one of my favorite baby registries! 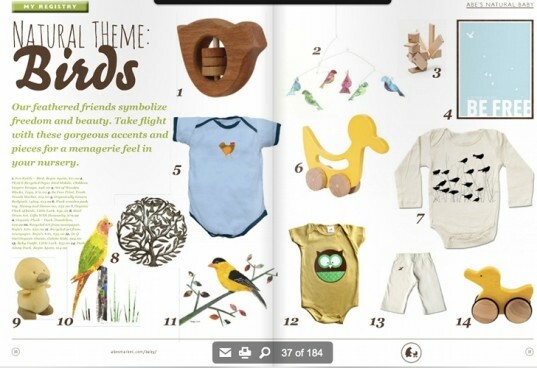 They have a beautiful magazine layout of all of their baby products. Each product photo links to its product page so you can easily add it to your registry. At Abes Market you will find all natural and organic personal care products for mama and baby, products to pack for birth, clothing, slings, nursery decor, toys and playing items, teethers, feeding products, cloth diapers, safe cleaning supplies, baby proofing items, bath products, sleeping items, stuff for papa’s and more! Diapers.com has a huge selection of green products including those hard to find items like carseats, strollers and highchairs. Diapers.com has over 30 brands of cloth diapers, organic baby carriers, diaper bags, toys, clothing, feeding, boosters and more. And they have great, super-low prices, plus free 2-day shipping on orders $49 and over. BabyList is an amazing application that allows you to register anywhere! You install their browser button then you can add any page on the internet to your registry. This is especially great if you want to register for doula services, a meal delivery service, a night nurse, second hand stores or something that you can’t find on a typical registry. But it also works for any store on the web so you can create one registry that links to several stores. 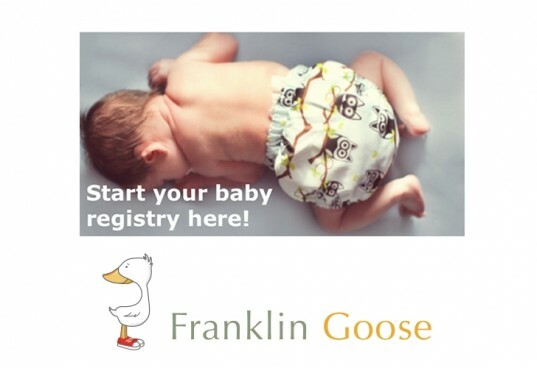 Franklin Goose is a woman-owned eco-friendly store with everything you will need for your baby. You can register for feeding products, breast pumps, baby monitors, high chairs, cloth diapers, nursery decor and furniture, organic clothing, toys and teethers, bath and potty items, organic baby gear, books, health and safety- including baby proofing, giftsets and more. They also have a flat shipping rate of $5. 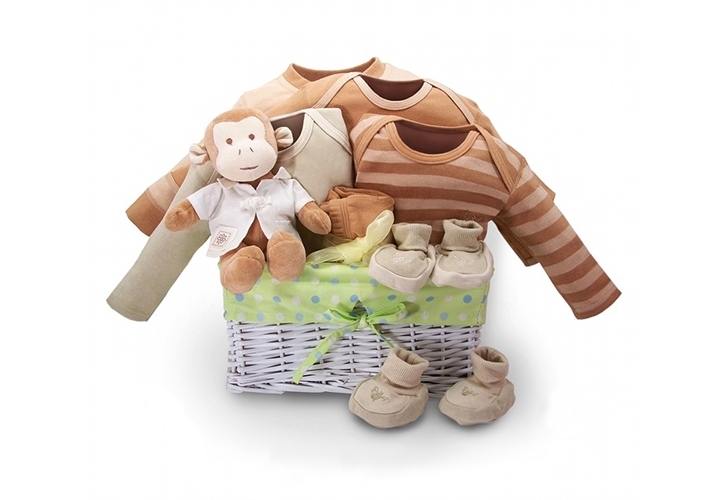 Giggle is an online superstore filled with a variety of modern baby and child products. 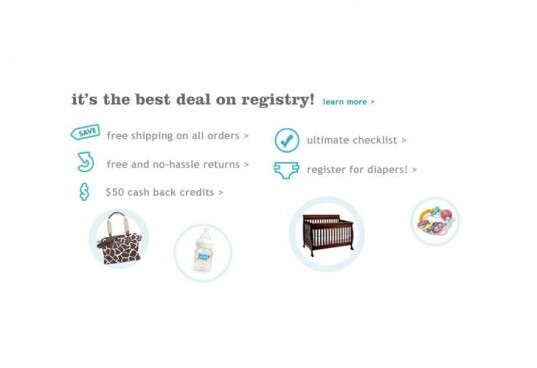 Giggle doesn’t have a green category search, so the downside is that you must be somewhat familiar with eco-brands before beginning your registry. But Giggle does have a large selection of organic and non-toxic items, so they are worth browsing. I especially love their pre-designed nurseries. You can get free shipping on all orders over $75. BabyEarth has a nice combination of eco-friendly and conventional baby products. You can find maternity products, cloth diapers, changing tables, bedding, strollers, feeding gear, mattresses, clothing, mobiles, skin care, play yards, organizational items, and more. BabyEarth also has an app on Facebook so you can even manage your registry from there. They have free shipping for all orders over $99. 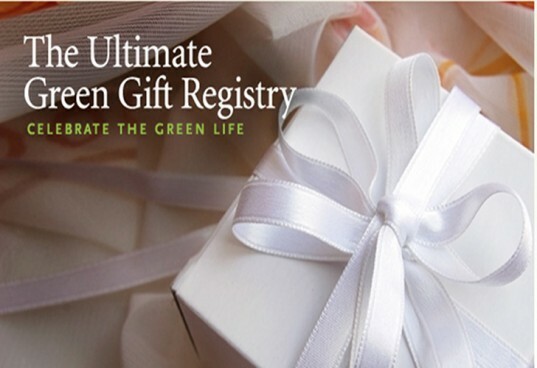 The Ultimate Green Store has a wide selection of gifts for the whole family. For your registry, you can find infant organic clothing, blankets, bedding, nursery furniture, toys, air filters, cloth diapers, organic towels, organic skin care, feeding products, nursing pillows and more. Did you know that Etsy had a gift registry? Now you can register for those handmade organic booties or hats you’ve been eyeing! On Etsy, you can find handmade toys, teethers, clothes, slings, decor, bibs, bedding, diapers, personal care/skin care, wipes and more. Not Finding Out doesn’t have all of your newborn needs, but I think it is a great site if you don’t want to find out the gender of your baby! You have your health provider fill out a form to mail to Not Finding Out. You send your friends and family to the site to purchase the gender specific items you want and when you have your baby, Not Finding Out sends you the gifts! Not Finding Out has a nice eco-friendly selection of clothing, toys, diaper bags, blankets, high chairs, bedding, car seat covers, towels, toys, wet bagsand more! DO NOT register at Giggle! They're too disorganized to mark items as purchased from your registry & their customer service leaves much to be desired. I registered there & totally regretted it. What a waste of time! My MIL had purchased a couple registry items there for my birthday & was disturbed when the items were still not marked as bought days later. She didn't want other people buying the same items & neither did I. She called them about the problem and they did nothing. She was livid. Finally I had to call them and the manager told me they don't mark items off till they have time (Seriously?) ... so he'd make sure to fix it that night. I'd thought they were this great local modern green store with an online presence so wanted it to work out. The next day I looked up my registry & it was still the same almost a week later!? I couldn't believe it. I did not need this stress while pregnant & working! I deleted my registry then. Let me add that their prices are often inflated as well. Use their website to find out about modern green products but don't make the mistake of registering there! And find the same items cheaper elsewhere! We were looking to register for an organic crib mattress and everything for the nursery - mattress pads, organic blankets, onesies, bassinet mattress etc - found a gem of a store called Organic Lifestyle. They offer a discount off registry items and customer service was superb. Abes Market is by far one of my favorite baby registries! They have a beautiful magazine layout of all of their baby products. Each product photo links to its product page so you can easily add it to your registry. At Abes Market you will find all natural and organic personal care products for mama and baby, products to pack for birth, clothing, slings, nursery decor, toys and playing items, teethers, feeding products, cloth diapers, safe cleaning supplies, baby proofing items, bath products, sleeping items, stuff for papa's and more! Diapers.com has a huge selection of green products including those hard to find items like carseats, strollers, highchairs. Diapers.com has over 30 brands of cloth diapers, organic baby carriers, diaper bags, toys, clothing, feeding, boosters and more. And they have great, super-low prices, plus free 2-day shipping on orders $49 and over. 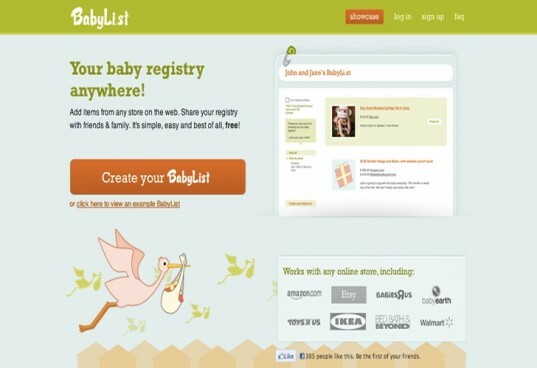 BabyList is an amazing application that allows you to register anywhere! You install their browser button then you can add any page on the internet to your registry. This is especially great if you want to register for doula services, a meal delivery service, a night nurse, second hand stores, or something that you can't find on a typical registry. But it also works for any store on the web so you can create one registry that links to several merchants. Giggle is an online superstore filled with a variety of modern baby and child products. 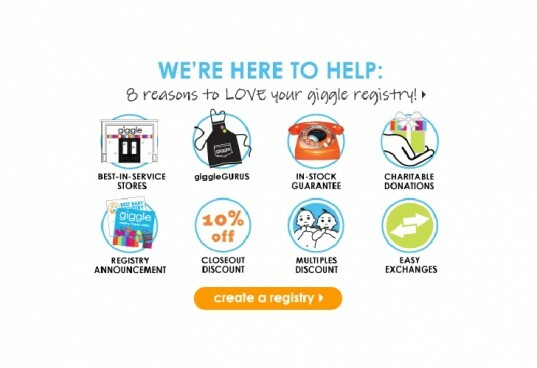 Giggle doesn't have a green category search, so the downside is that you must be somewhat familiar with eco-brands before beginning your registry. But Giggle does have a large selection of organic and non-toxic items, so they are worth browsing. I especially love their pre-designed nurseries. You can get free shipping on all orders over $75. BabyEarth has a nice combination of eco-friendly and conventional baby products. You can find maternity products, cloth diapers, changing tables, bedding, strollers, feeding gear, mattresses, clothing, mobiles, skin care, play yards, organizational items and more. 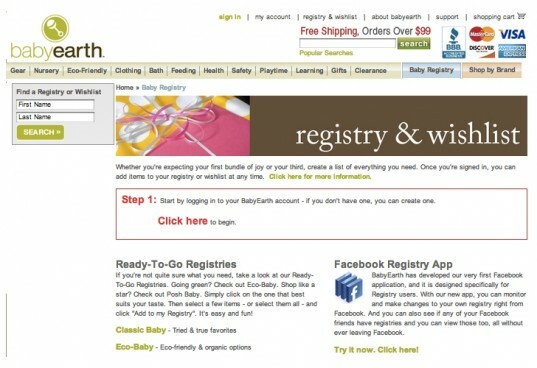 BabyEarth also has an app on Facebook so you can even manage your registry from there. They have free shipping for all orders over $99. 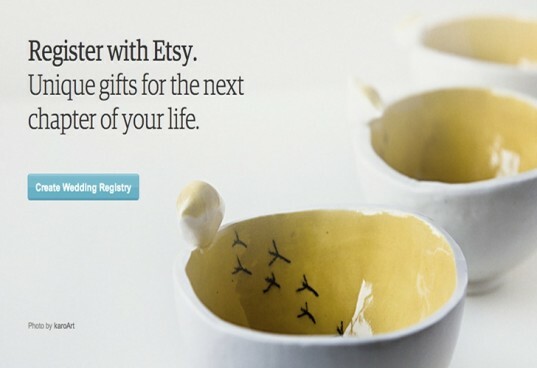 Did you know that Etsy had a gift registry? Now you can register for those handmade organic booties or hats you've been eyeing! On Etsy, you can find handmade toys, teethers, clothes, slings, decor, bibs, bedding, diapers, personal care/skin care, wipes and more. Not Finding Out doesn't have all of your newborn needs, but I think it is a great site if you don't want to find out the gender of your baby! You have your health provider fill out a form to mail to Not Finding Out. You send your friends and family to the site to purchase the gender specific items you want and when you have your baby, Not Finding Out sends you the gifts! Not Finding Out has a nice eco-friendly selection of clothing, toys, diaper bags, blankets, high chairs, bedding, car seat covers, towels, toys, wet bags, and more!